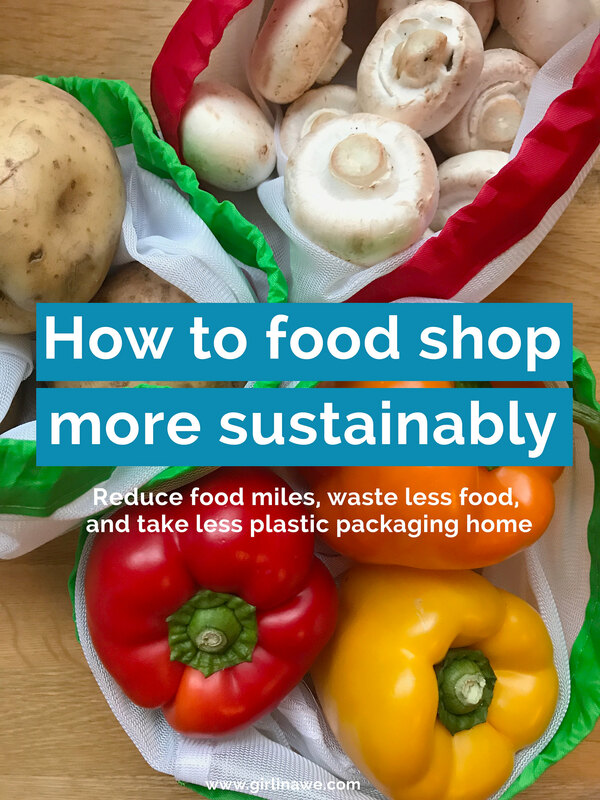 One of the hardest things about sustainable living is food shopping, so today we’re going to talk about sustainable food shopping and how we can reduce food miles, and the amount of plastic packaging we take home. I’m so happy to see so many people aiming to live more sustainably and to buy things with less plastic packaging in 2018. It truly stokes the fire in my soul. If you’re a complete beginner to sustainable living, you might find this handy post about how to start living more sustainably useful. Quick note before we start; I live in the UK, so some of these things might seem odd if you’re from the US or Canada, where bulk buying is so much more common. Hopefully, there are at least a couple of tips you can take away no matter where you’re living. A couple of years ago, the UK government introduced a 5p charge on plastic carrier bags to encourage people to use reusable bags, or learn to juggle. The charge worked pretty well because us Brits hate paying 5p for things and loved the challenge of juggling a week’s worth of shopping down the carpark because we forgot our bags for life. The scheme has been pretty successful, and in the first few months, 6 billion fewer plastic bags were used in comparison to before the scheme was introduced. The irony is that we take our reusable bags and stuff them with delicious food wrapped in single-use crappy plastic. I would argue that as the definition of irony. How supermarkets and the government failed to see and act on that one that is beyond me. So, what can we do to reduce the amount of packaging, waste, and food miles when we shop? My sister got me produce bags for Christmas thinking it was a joke gift because of how much I moan about plastic packaging, but they are so not joke gifts. They are actually the most useful Christmas gift I received this year, and I love them. Produce bags are mesh/fabric bags that replace those horrible single-use plastic bags in the fruit and veg section. You simply put your loose veg in them and carry on with your shopping. It is that easy. I am not aware of a high street store, or even a supermarket (seems like a missed opportunity), that you can buy them from. You can get them online very easily though; a swift Google will throw up loads of suggestions (and I’ve even done that for you). Make sure you get a few in different sizes to cover everything you might buy. I think these are the ones my sister got me; there are 12 in total in three different sizes, so I’m well covered. If you can get to a local farmers market or have a greengrocer in town who sells local produce, support the crap out of them. I know it’s not always possible though, so don’t stress; for me, living more sustainably is about us all doing the best we can. By buying locally as much as possible, you’re supporting your local economy and reducing your food miles. Food miles are how far your food has been transported to you. The further food travels, the more carbon dioxide (CO2), nitrous oxide (NOx), and particulate matter are given out as a result of transport, and all of these things contribute to global warming and air pollution that harms our health. Knowing how much food you’re going to use between shops is so helpful because it stops you buying things that will go to waste, which saves you money. I highly recommend making a meal plan (even a rough idea of what kind of thing you might eat throughout the week) and then figuring out how much you need to buy. This can stop you getting caught up by 3 for 2 or BOGOF offers if you know it won’t get used. My Nan goes to the shop pretty much every day and I remember being slightly horrified by the amount of salad and veg that was thrown away because she would keep buying too much. She seemed to think that if she kept buying it, it would get eaten but we couldn’t eat it fast enough. I think my Mum has reigned her in a little bit now, thankfully. If you’re struggling to understand or track how much food you’re throwing away, separate food waste from your general waste for a couple of weeks and that should give you a good idea. If you can, compost any food waste, or make sure it goes in your food waste bin if you have one. For me, checking labels when I’m food shopping is second nature now. It is very difficult to do a food shop that is entirely plastic packaging free so get used to figuring out what you can and can’t recycle. You will be surprised by how much you can’t recycle. The organic oats I buy (because the supermarket doesn’t sell any other organic oats) come in non-recyclable packaging. I mean, that seems like a bit of a slap in the face to me, don’t you think? These oats have been lovingly grown without any toxins to be healthier for the soil, the environment, and the eater, and then you wrap them in something that cannot be recycled? What? Why? I don’t want you to save the soil, the air, me, but kill sea creatures. Why would you even think I would want that? WHAT’S WRONG WITH PAPER?! Someone has to get angry about these things, and it’s always me. It’s inevitable you will have to buy things in plastic so make sure you’re buying recyclable plastic as much as you can. It’s not the solution but it’s boatloads better than non-recyclable. There aren’t a huge number of places you can buy bulk food, like oats, flour, coffee, etc in the UK. I know there are a few Whole Foods in London, Edinburgh has Real Foods, and there are probably a few places with bulk food options scattered around the country. If you don’t know what that is, it essentially means you walk into a place and they have huge bins or containers of things. You take your own jar, box, or bag, load them up and then pay by weight. They seem like an amazing idea, and I was so excited when I saw bog standard grocery stores in Canada with bulk oats and coffee. Hopefully, they will become more popular in the UK. But, what if you don’t live near somewhere that has a bulk option? I have seen zero waste bloggers recommend buying as big a package of that thing as you can as it often works out cheaper and uses less packaging than buying smaller packages. However, huge packages of things aren’t that common in the UK either, so it’s a difficult one. All you can do is your best here. Seasonal produce is a huge work in progress for me because I struggle to remember and keep on top of what’s seasonal. We’re so used to walking into a shop and buying and eating whatever we want all year round that we don’t even think about how far something travelled to us. As we mentioned further up, the further food travels, the more pollutants are given off, so we want to keep those miles as low as possible. This can seem quite limiting, especially if you love avocados as much as me. I’m not saying restrict yourself to only what’s in season in your country. When you feel restricted, living sustainably becomes hard and unenjoyable and it’s then that you give up. It’s about striking a balance and compromise. So, enjoy something exotic in your shopping basket but try to make more and more of your shop seasonal. You should be able to easily find out what’s seasonal to the country you live by searching for it. Since we’re in January and I read this yesterday, here’s Rhyme & Ribbons guide to seasonal eating in the UK in January. I believe her monthly newsletter usually contains a list of seasonal food and recipes (I’ve only just signed up myself) so that sounds like a really easy way to keep on top of it. One of the ways I’ve been trying to make this really interesting for myself is to look at what’s seasonal and find new recipes. I really, really want to make artichoke soup because I had some at work a few weeks ago and it was honestly one of the best things I’ve ever tasted. I’m pretty sure I bang on about this in every single blog post about living more sustainably, but it’s true. If there’s something you’re not happy with about where you shop, let them know. Supermarkets and food producers/manufacturers are beginning to come under more pressure from us to package things in a more sensible and sustainable way, so it is working. I mean, Tesco have stopped responding to me now but I’m hoping that’s because they’re so busy listening to me…I live in hope. And Tesco live in hope I don’t moan at them on Twitter again. I’m pretty sure most of us would love to have the space to live off the land and grown all our own produce. Unfortunately, that isn’t really possible for the majority of us, but growing a couple of things can make all the difference. If you don’t have a garden, why not grow your own herbs? If you’ve got a garden with space, do a little research and give growing something a go. When I was a kid, my Dad used to grow potatoes and it was so exciting seeing them being dug up and then turned into Sunday dinner. If you have any tips for shopping less wastefully and buying less food wrapped in plastic, let us all know in the comments. And, as always, if I’ve mentioned something in passing without explaining it, pull me up on it and I’ll explain it and do better next time!